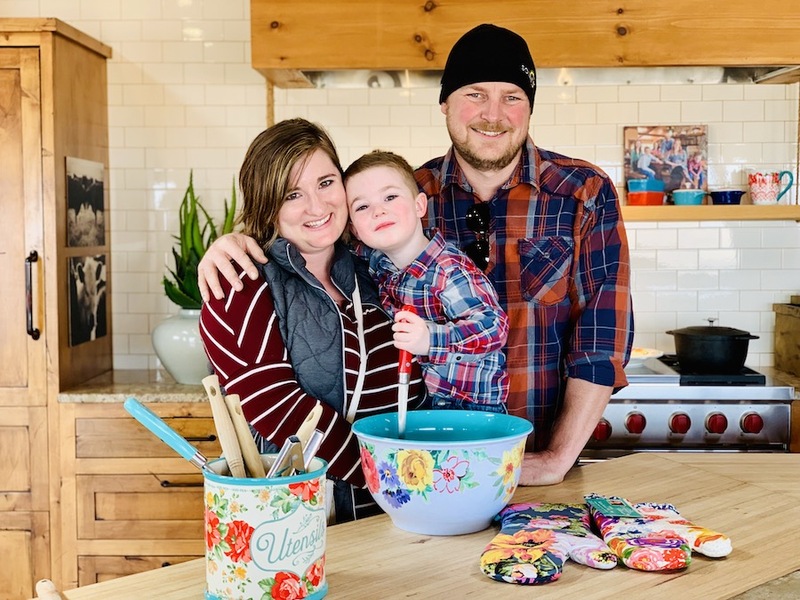 The Pioneer Woman Ree Drummond and her husband, Ladd, have been so generous to open up their Oklahoma lodge on Drummond Ranch to visitors. 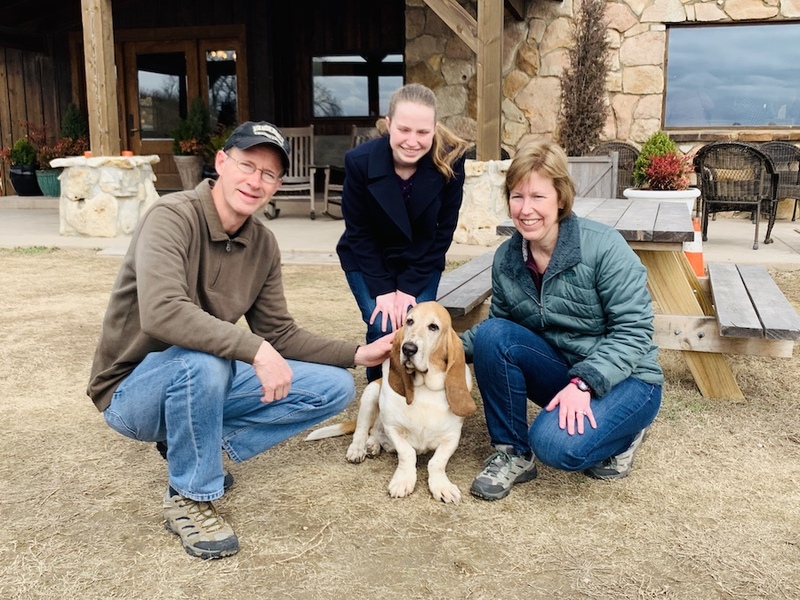 In fact, people come from near and far for the opportunity to drive 18 miles into the country to visit The Lodge, which serves as a guest house for the Drummonds and a production location for the filming of Ree’s popular TV show. 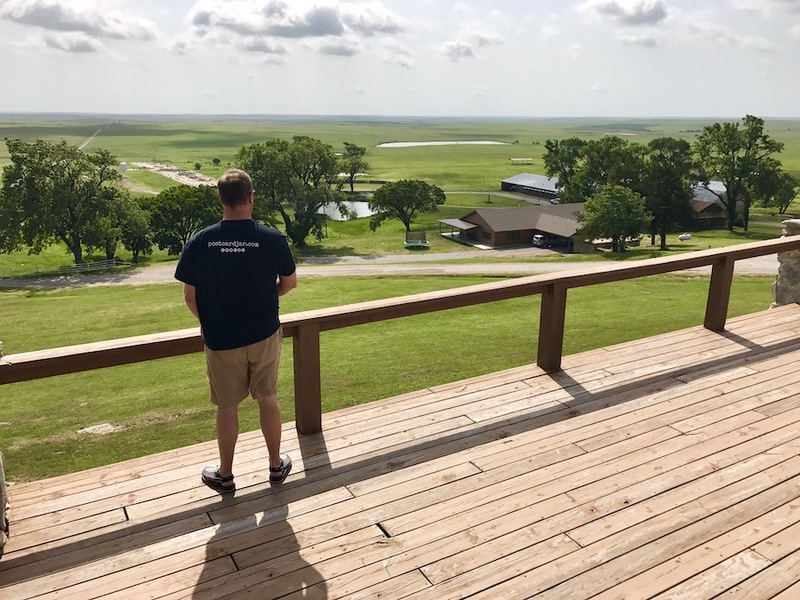 If you’d like to visit The Lodge on your visit to Osage County and Pawhuska, then you’ll want to read this! 1. Check the website for open dates. 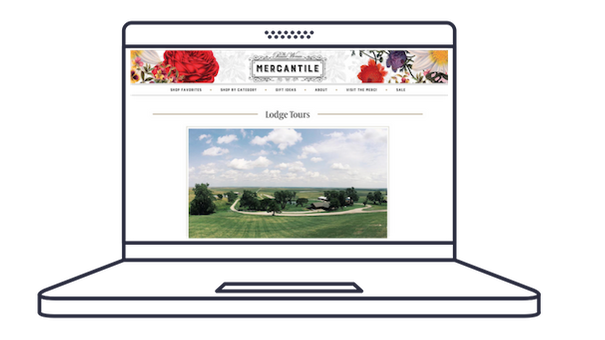 To see which dates The Lodge is open for tours, simply check The Pioneer Woman Mercantile website HERE. The dates are usually posted at least several weeks (if not months) in advance. There’s also always a chance they could add more, so be sure to check back often. If The Lodge is closed to tours, there’s a good chance it’s because the film crew is in town and shooting the show. (And this means it’s likely Ree and Drummonds are in town). If The Lodge is not open on the dates you can come, don’t fret! There are plenty of other fun things to do in Pawhuska and Osage County when you visit The Pioneer Woman Mercantile. Be sure to open the Visit the Osage website (or download their app) before you come for more ideas. Admission to The Lodge is free (thank you Ladd and Ree) but tickets are required. Visitors must go to The Merc (532 Kihekah Ave, Pawhuska, OK) the day of their lodge tour to get a ticket with directions to the Drummond Lodge. Tickets are available at the check out counters or the gift wrapping station – just ask one of the hospitable staff there for a ticket. While there is no cost to receive a ticket, they are only good for that day’s date and are not available in advance. 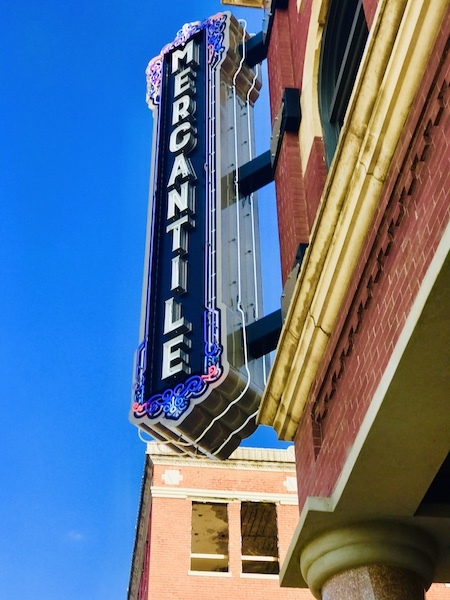 The Pioneer Woman Mercantile website says the The Lodge will be open from 9 a.m. to 5 p.m. on the open dates, but it’s best to check with the staff at The Merc before you drive out to the lodge. 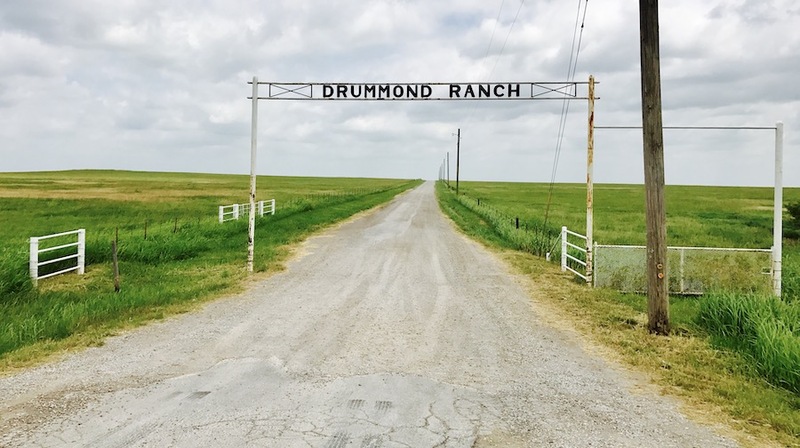 If you want to visit The Drummond Ranch Lodge, you should know that you’ll have to traverse a few miles of gravel roads. That shouldn’t stop you though. 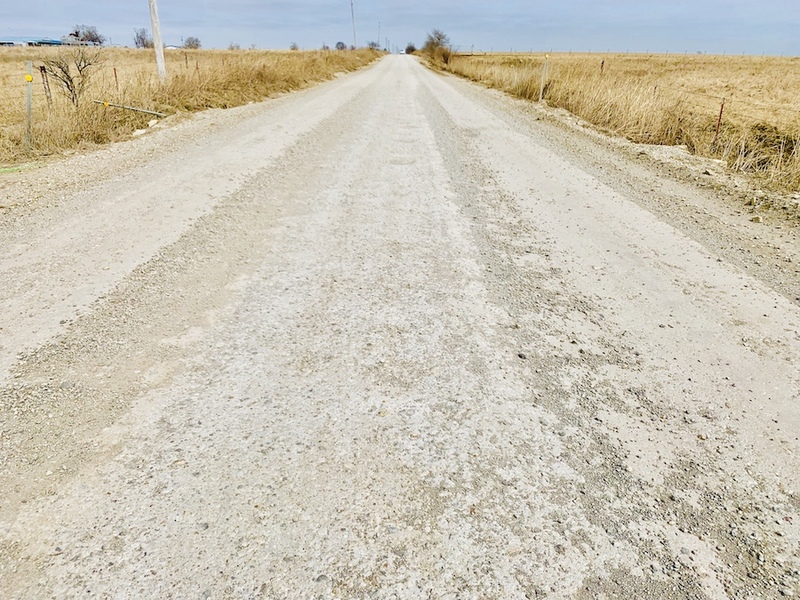 After all, gravel roads have been used for decades. You will want to exercise some caution. You can’t go the same speed you would on a highway, so slow down a bit. That said, it is just fine to drive faster than 25 m.p.h. Considering how beautiful the country is, the slower speed is perfect for you to soak it all in, and see if you can spot the wild horses which often graze along the road. And if your car gets a little dusty? Well, there’s a great car wash back in Pawhuska. 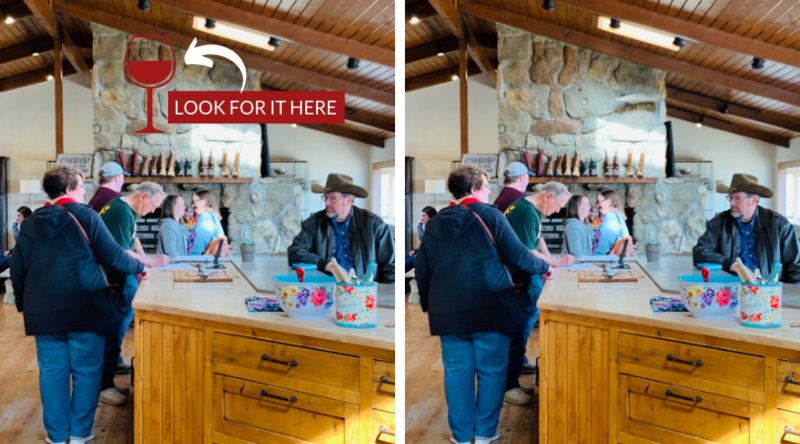 There are several folks who meet and greet visitors at The Lodge on Drummond Ranch. One of the regulars is our friend, Bill Sweeden. 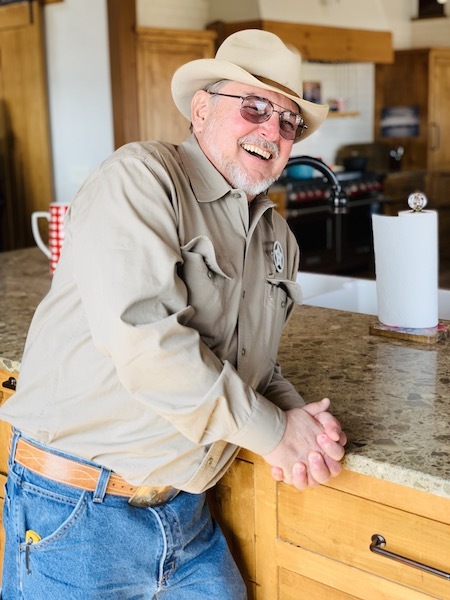 Bill will be more than happy to answer your questions, show you around, and tell you all kinds of stories about life on Drummond Ranch. He’s usually wearing a hat and a badge, so he’s easy to spot. 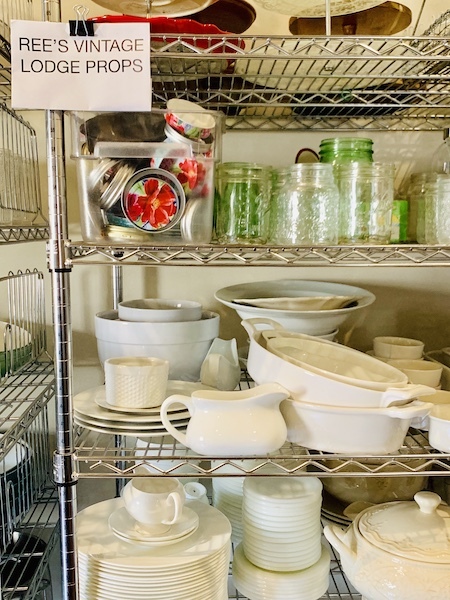 Ask Bill to show you around the enormous kitchen and maybe he’ll even show you what we like to call the “measuring cup heaven” drawer. 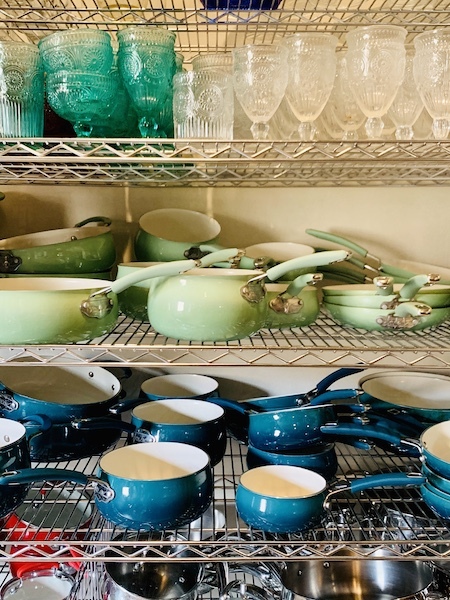 One of our very favorite parts of The Lodge at Drummond Ranch is the newly renovated walk-in pantry behind the kitchen. I know jealousy is a sin, but I can’t seem to help myself from having pantry envy every time I walk into Ree’s. It is a huge, well-organized space with lots of natural light from the skylights above. It even has a rolling library ladder for reaching the top shelves. 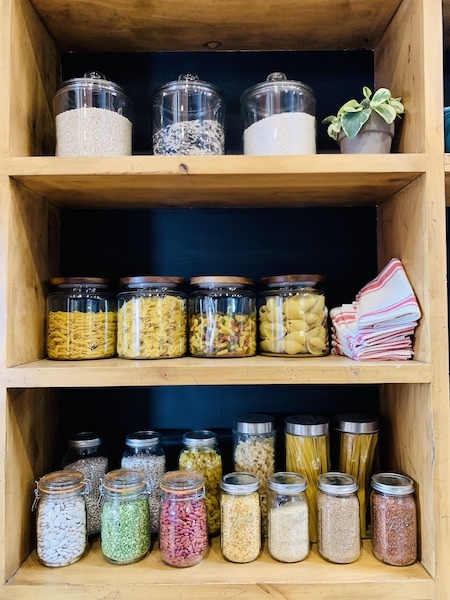 We missed this pantry the first time we visited; we included it here so you don’t. 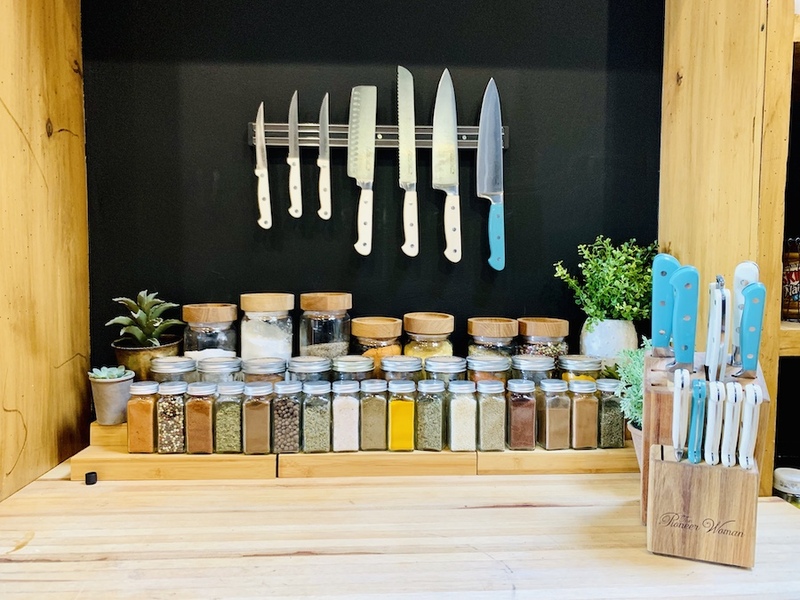 And the jaw-dropping pantry is especially worth a look since she Ree-did it! 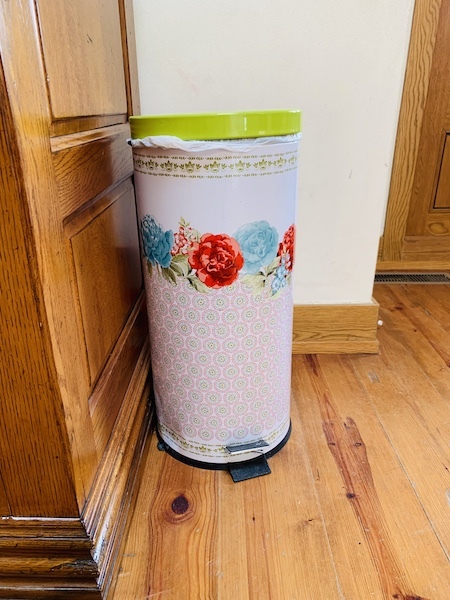 When we stopped by The Lodge a few weeks ago, Bill pointed out a few new Pioneer Woman products that had just arrived, including a new teal Kitchen Aid mixer and a floral trashcan. 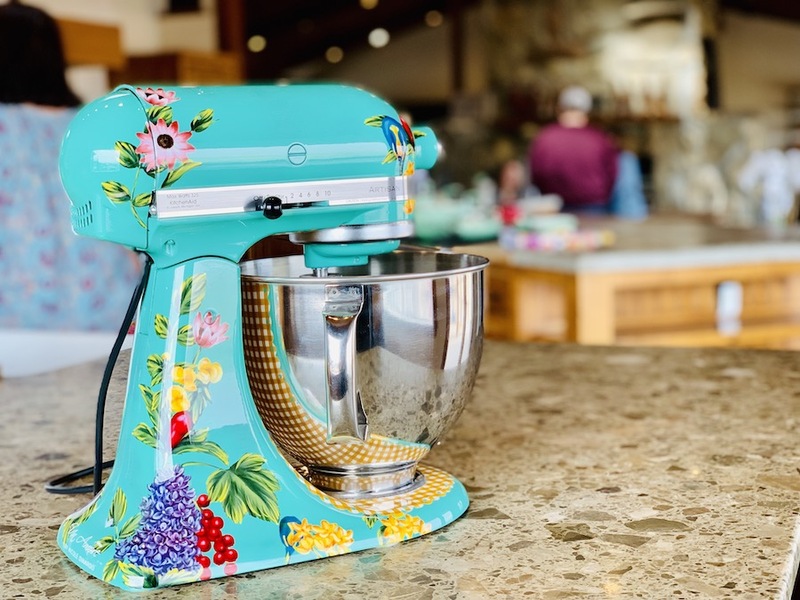 He said both items were garnering lots of attention from Pioneer Woman product collectors and they debuted at The Lodge. 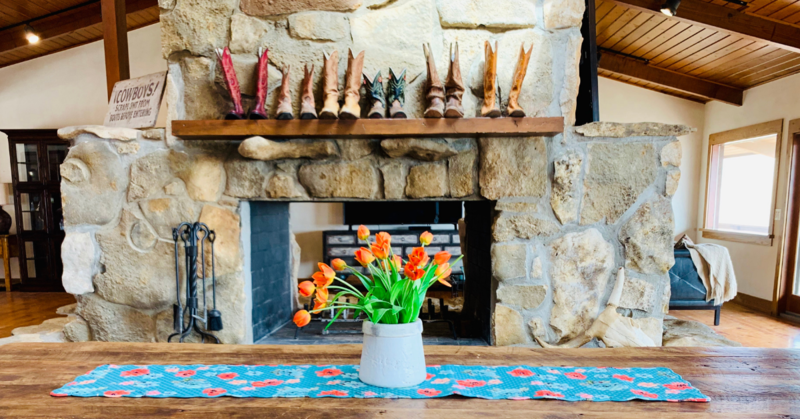 If you have made the trek out to The Lodge, we think it’s safe to say that you probably enjoy cooking and watching “The Pioneer Woman” on television. 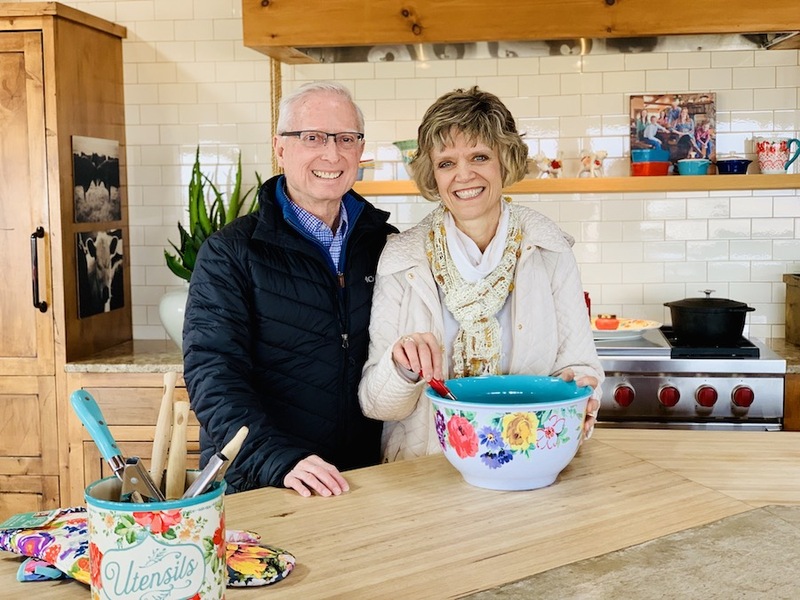 The folks at The Lodge have left a couple of pieces of cookware on the stove and counter where you’ve seen Ree cook so many of her delicious dishes. So when you’re there, pick up a spoon and pretend to mix up Ree’s Knock You Naked Brownies in the mixing bowl. You know you want to and we promise no one will laugh at you. Indeed, they’ll be in line waiting their turn. When we’ve visited, Ann loves nothing more than to stand across the counter and take pictures of people like these. Somehow, she even gets the husbands to smile. On our last visit to The Drummond Ranch Lodge, Bill shared with us a little history of the building. In the stones above the fireplace, you can make out the shape of a wineglass. This is because that was the livestock brand of the family who originally built the building. See if you can spot it. As impressive as the kitchen in the lodge is, the view is even more spectacular. Also, while eating at The Pioneer Woman Mercantile is a treat, but dining outside at The Lodge on a nice day is heaven. 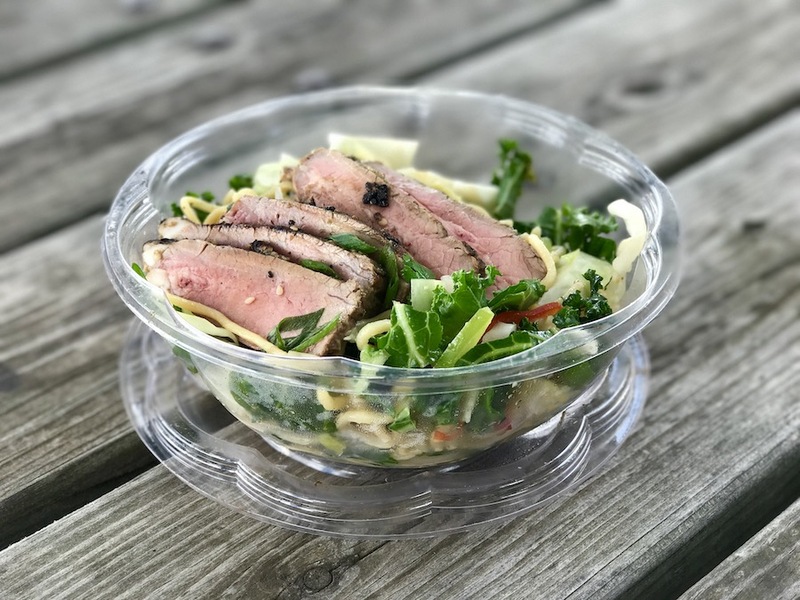 We recommend grabbing something to go from the deli at the Merc (don’t forget a fruit flavored iced tea or lemonade) and eating your lunch on one of the picnic tables outside near the parking area at The Lodge. The view is absolutely stunning and you’ll enjoy this unique dining experience you can’t get anywhere else. If you’ve watched Ree’s show on TV, you know that Ladd occasionally hides a fake snake to scare her. 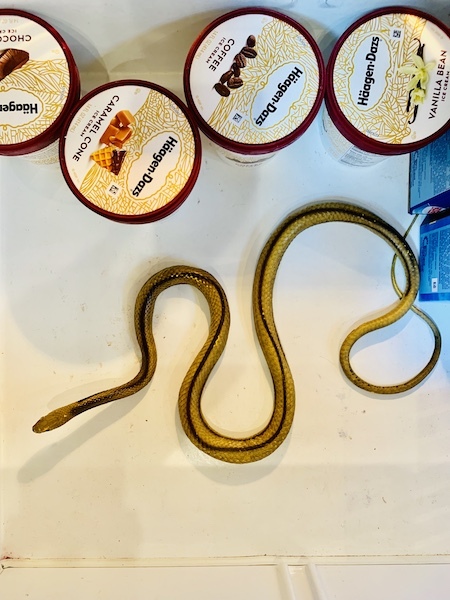 On our most recent trip, we found this realistic pretend snake waiting to scare us–so be on the lookout. Pro-tip: If the snake is moving, it isn’t fake. Back away slowly. 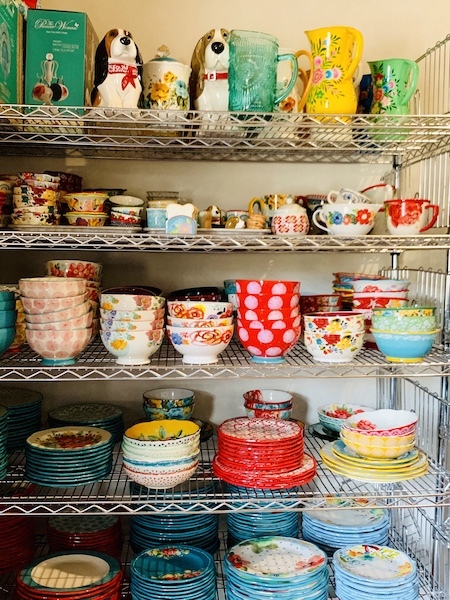 Are you a fan of Ree’s dishware? 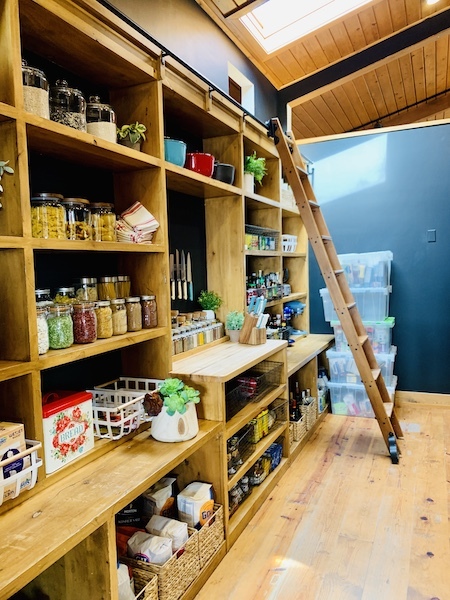 In the back section of The Lodge, there is a room with shelves and shelves and shelves of her products. Take some time and admire her beautiful collection. We think you’ll really enjoy it. 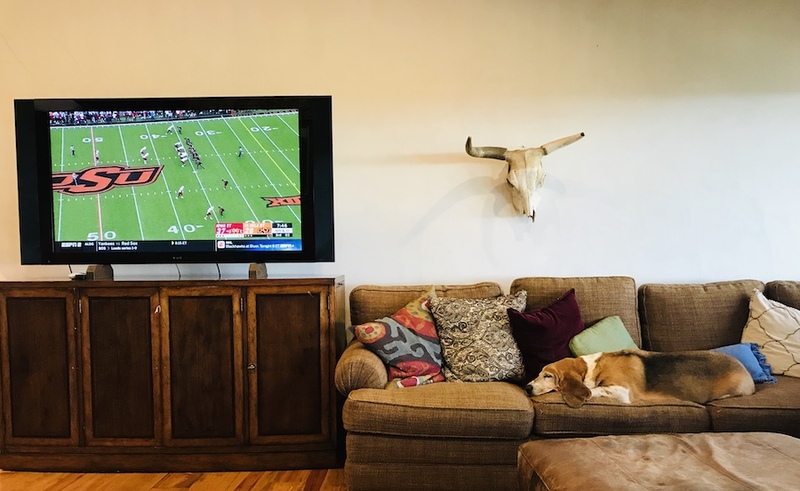 When you visit The Drummond Ranch Lodge, you just may find one of Ree’s dogs there, hanging out on the couch and wanting to be loved by all the people coming through. 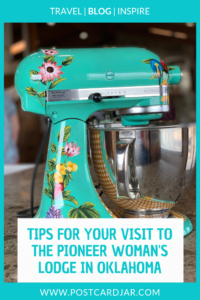 Do you have questions about visiting The Pioneer Woman’s Ranch Lodge? Let us know in the comments below. We’re happy to answer them or help you find someone who can. Thank you for posting. My first trip will be in May. Can’t wait to see the Lodge and all Pawhuska has to offer. We’re excited for you to see it and experience Osage County. Check out the Pawhuska section of our site (under the destinations tab) for lots of other ideas for things to see and do in Osage County. I will be in OK in a week. Can’t wait celebrating my birthday April 26 with a visit to the lodge. You will LOVE IT! Please let us know if you have any questions or if there’s anything we can do to help while you’re in town. We should be in Pawhuska.